Before we begin this spooky month of reviews, I need to announce last week’s winner of CURIOSITY HOUSE: THE SHRUNKEN HEAD. It’s none other than Michael Gettel Gilmartin. Congratulations. You can find Michael on his own blog, THE MIDDLE GRADE MAFIOSO, or on his group blog, PROJECT MAYHEM- The manic minds of middle grade writers. Turn off the lamps and turn on the flashlight. I’m dedicating this month to all that is spooky in MG. I’ll recommend the best in ghosts, goblin, and creature type stories. The featured books are great for this time of the year, but they actually can bring goose bumps no matter what month you decide to read. First up is this new title, MOTHMAN’S CURSE. Josie is our 12-year-old heroine and narrates the story. Combined with her two younger brothers, the trio are smart, adventurous, and for the most part get along. Their unique personalities set them up to have success. 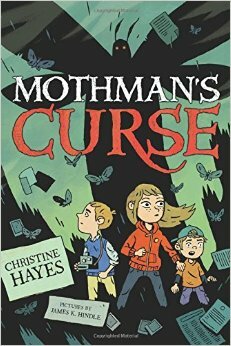 The pace is perfect as the kids deal with everyday life and this strange creature known as the Mothman. Spooky for sure and scary, too, but not enough to bother the majority of MG readers. Although fairly hefty for a MG book, drawings of the key events in the story are interspersed every chapter. It’s an enjoyable ride all the way to its thrilling conclusion. The family business is an auction house where curious items are auctioned every weekend. Such a unique sidelight, and one of the youngsters, Fox, is a an up and coming auctioneer. He even holds his own auctions just for other kids. It was great to see the opposite side of Josie and Fox’s personalities come through. Josie gains more confidence and Fox shows he can be more serious. The story is based on a real urban legend that I knew nothing about. 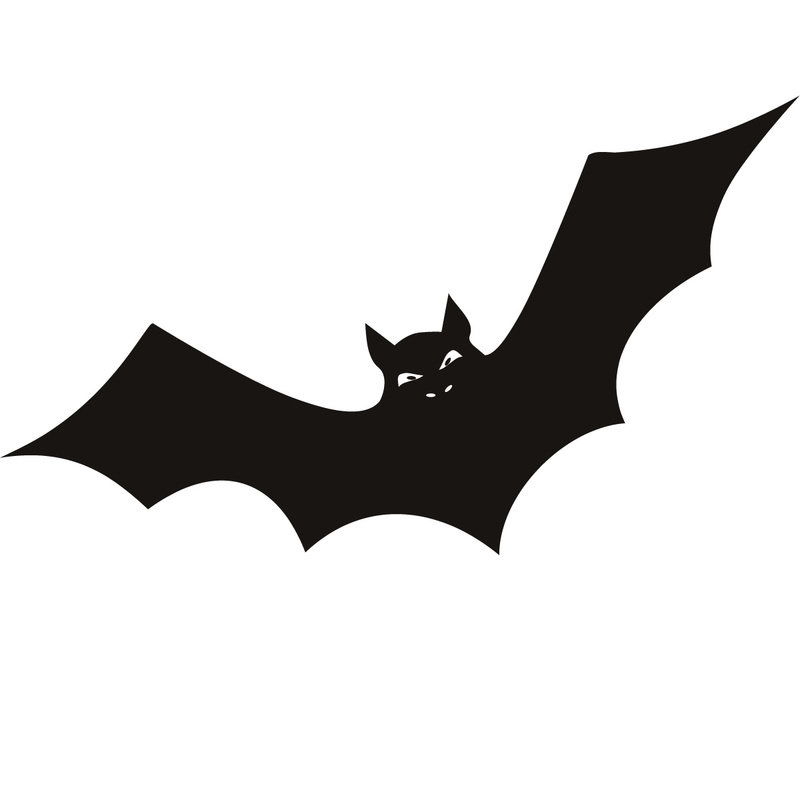 The author provided links if readers want to learn more about Mothman. The ending is a fast paced conclusion and will keep readers flipping the pages. There’s a touch of time travel with Josie and they were some of my favorite scenes. She was able to see what happened in the past and figure out how to deal with the future. Fox kept staring, his breath rough. I pulled my sweatshirt sleeves down over my hands to slow the cold creeping into my limbs. Mason curled up against me. I could feel his heart racing in his chest. 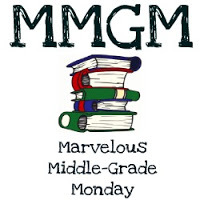 This entry was posted in Reviews and tagged Christine Hayes, female protagonists, Marvelous Middle Grade Monday, MG book reviews, Middle grade, Mothman's Curse. Bookmark the permalink. Sounds like you’ve got a perfect book theme for October. This sounds good, especially with the auction and the time travel. So happy to have won CURIOSITY HOUSE: THE SHRUNKEN HEAD! And thanks for the blog shout-outs. Now you have given me another one for the TBR pile. I like spooky books, so am looking forward to your October picks. You will like this one for sure. I emailed you for an address so as soon as you respond I’ll send it your way. Thanks for being a frequent visitor. I love that this is based on an urban legend and there are links to find more information about it. I do like to be scared as long as things don’t get terrifying. Thanks for telling me about this one. It sounds perfect for this time of year. Nothing too terrifying here. Just a fun read with some creepy moments. Ooo, a touch of time travel. How intriguing! Scary books are never my first choice, but I know a lot of kids love them. This is the greatest October book theme! Congrats to Michael Gettel Gilmartin on winning last week. Intriguing! I love it when book characters have unique interests. Now you’ve got me thinking I should find a scary book or two to read. What a fun setting! I have a friend who’ll be releasing an NA that’s high on the uncanny side of things and set against the auction, antique hunting backdrop. I’ll have to tip her off to this book. 🙂 Thanks for the recommend, and happy MMGM!